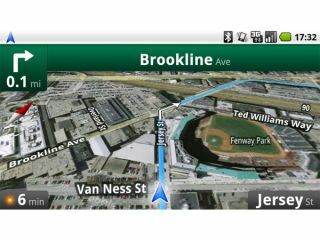 Google has used the new Android 2.0 release to unveil a world-beating feature - Maps Navigation, turn by turn directions direct from your mobile. It's a move that's likely to have the navigation specialists of this world worried to say the least - Google will suddenly be able to harness millions of phones as genuine sat navs. The cool thing is it relies heavily on voice - you speak places or directions to the phone and the device figures out where it is you want to go. Using the power of Google search, this means you can ask for things like 'pubs near Beavo Street' and it will use local search to find the best options from you. The Motorola Droid is the first phone to make use of the system, and a demo video shows the Google Navigation (which is in beta) turning up with finger-friendly touch icons. And it seems that Google has done its homework on the new service too - according to Gizmodo, which has been briefed all about the service, it will offer cached maps for when you lose connection. There will also be layers as well, meaning extra content like showing where tube lines are in real time as well as other points of interest. We're very excited to see how this plays out in real time, and how the likes of TomTom and Garmin react, especially when they cost a fairly substantial sum in the Apple App Store. Check out the video to see it in action, and work out for yourself - has Google suddenly found out how to own another market?